Canton senior Matt Minichiello has been selected as the HockomockSports.com Player of the Week for September 11th through September 17th; the second player chosen for the 2016-2017 season. Minichiello has had an impressive start to the 2016 season and had a pair of strong performances this week. Canton golf is off to a 4-0 start, including a 2-0 record in the Davenport, and Minichiello has played a vital role for the Bulldogs. 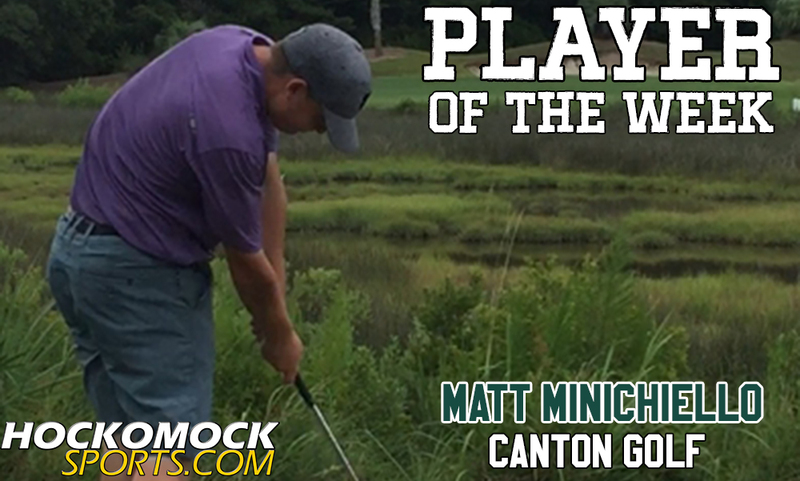 This week, Minichiello was the medalist in both of Canton’s matches and has been the top guy for the Bulldogs in three of their four contests thus far. On Wednesday, Minichiello carded a low round of 37 at Blue Hills Country Club as the Bulldogs picked up a 152-169 win over Sharon. On Friday, Minichiello shot a career-low 34 par, also at Blue Hills, as Canton picked up a 146-156 win over two-time defending Kelley-Rex champs Mansfield. Minichiello was inserted into Canton’s lineup this season after not playing in matches in previous seasons. “That goes to show you how hard he has worked and how much he truly cares about golf,” Barucci said. Minichiello and Canton will look to stay unbeaten as they welcome North Attleboro to Blue Hills on Tuesday in a key Davenport division matchup.